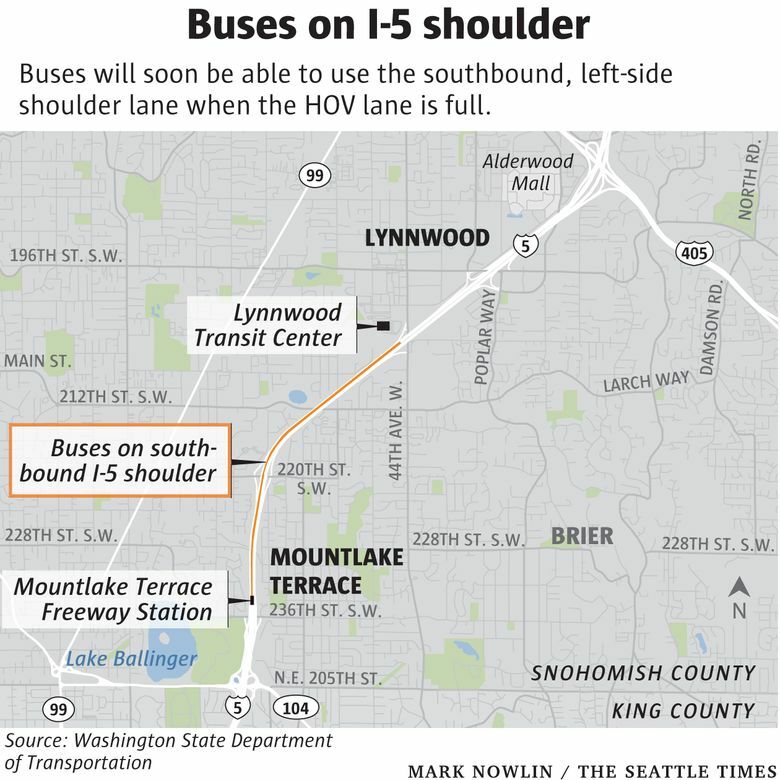 Buses will be able to use the shoulder lane starting Monday on 1.5 miles between the Lynnwood Transit Center and the Mountlake Terrace Freeway Station. Snohomish County bus commuters should be able to chop a few minutes off their trips, as Seattle-bound buses will soon be able to travel in the shoulder lane when Interstate 5 is congested during morning commutes. Buses will be able to use the shoulder lane starting Monday on a 1.5-mile southbound stretch between the Lynnwood Transit Center and the Mountlake Terrace Freeway Station. Buses will only use the shoulder lane if the neighboring HOV lane is clogged — running “substantially” slower than posted speed limits. And buses in the shoulder lane will operate under a 35 mph speed limit. There are 23 bus routes that use that southbound stretch of highway. Opening the shoulder lane to buses involved about two weeks of work, said Ally Barrera, a Washington State Department of Transportation spokeswoman. The shoulder was re-striped in places to make it about a foot wider, and crews replaced six drainage basins and moved two junction boxes that help monitor traffic data, Barrera said. The work is the first Sound Transit 3 project completed since voters approved the massive rail and bus expansion program in 2016. While most of the ST3 attention is focused on plans to add 62 miles of light rail across the Puget Sound region, the program also includes a slate of “early deliverables,” designed to ease commuting pain in the years and decades before the rail expansion is complete. “They are a low-cost solution that fully use the capacity of existing corridors and provide immediate benefits to fixed route buses,” WSDOT writes of shoulder lanes. The shoulder project cost about $400,000, split between Sound Transit and WSDOT. Sound Transit has begun a study to determine other places in the region where buses could potentially travel in the shoulder of clogged roadways — likely areas on Interstate 405, and state highways 518 and 167. Buses travel on highway shoulders on I-405 south in Bothell and on Lewis and Clark Highway in Vancouver. And general traffic can use the shoulder lane during the evening commute on northbound I-405 between Bothell and Lynnwood.